Can You Inspire Your Community with a Sign? LED signs, churches and places of worship. LED signs are an extremely cost-effective form of communication. A new LED sign in conjunction with your new or existing signs can cost less than 15 cents per thousand exposures while reaching the very people who are geographically close enough to act on your message immediately. How important is it for you to keep your congregation informed and growing? With an attention-grabbing LED message center, your church can reach out with inspiration and excitement to your flock as well as the surrounding community. LED displays provide energy-efficient communications 24/7, using light, color, and motion to bring greater visibility to your congregation’s programs. With the addition of an LED sign, your church can become your community’s beacon of light. An authorized reseller of Watchfire LED signs, Electra Sign and Prairie Sign offers full signage solutions throughout Manitoba, Saskatchewan and Alberta. From one-of-a-kind signs to all-encompassing sign programs, Electra Sign and Prairie Sign are dedicated to providing the highest quality service to all of our clients. That’s why when it comes to LED signs, we work exclusively with Watchfire Signs, which engineers and manufactures LED signs to help businesses and organizations increase visibility and drive growth. The company has created more than 15,000 LED signs for banks, retailers, schools, places of worship and other locations throughout North America and is thoroughly committed to the highest level of education, training and support to make our customers successful. Via WatchfireSigns.com Pixel pitch is a common way the sign industry describes an LED sign’s resolution. A pixel is comprised of a single grouping or cluster of LED diodes – typically one red, one blue and one green. The pixel may share a lens, as in the case of a surface mount diode, or it may be made up of three separate LEDs. The simple rule of thumb is that a lower pitch measurement, where each cluster is close together, results in a higher quality image. Unfortunately, some manufacturers have introduced alternative pixel distance calculations as a way to reduce costs. These configurations are often marketed as “virtual,” “enhanced,” or “optimized.” Here is a look at a few different pixel options and how they impact image quality. The Real Deal: True pixel configurations are measured from the center of each pixel and do not rely on sharing LEDs. 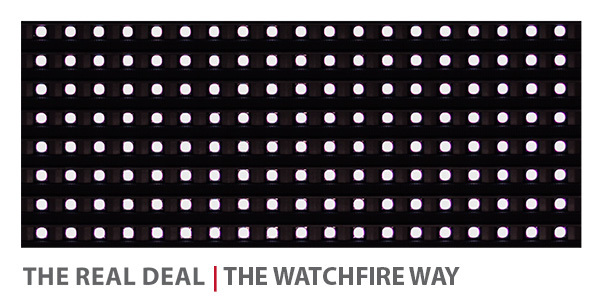 Watchfire’s 10mm uses a surface mount device (SMD) that contains red, green and blue under a single lens. This produces a high-quality display that provides exceptional resolution for crisp, vivid content and wide viewing angles. 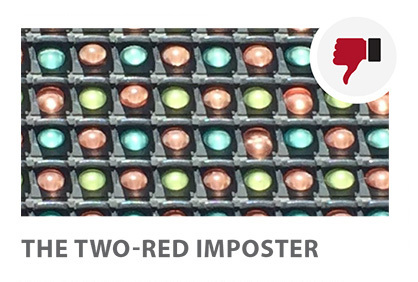 The Two-Red Imposter Module: Virtual pixel configurations are set up completely different. In order to pass off a lower resolution product, some manufacturers will add a second red LED to each cluster. This configuration results in a pixel that has two red, one blue and one green LED. Then to claim the product is high resolution, these deceitful manufacturers will market it based on the measurement between each individual LED. The product will be marketed as an optimized 10mm, but in reality it has a true pixel pitch of 20mm. The Missing LED Module: Another way some manufacturers are being deceptive is by using a technique known as LED sharing to claim a higher resolution. LEDs are shared to neighboring pixels to complete a grouping, effectively counting some LEDs up to four times. This layout has visibly larger spaces between LEDs and may even give the appearance that an LED is missing from the board layout. To market this configuration, pitch is measured between overlapping pixels so that the product can be promoted at a much higher resolution than it actually delivers. The Cold Shoulder Module: Some manufacturers also use through-hole LEDs for higher resolution products like a true 10mm sign. Placing individual red, green and blue LEDs into a circuit board with 10mm spacing creates a product that is not robust enough for long term reliability. This configuration also creates an issue known as shouldering, where the LED lenses block the light of neighboring diodes. Shouldering results in limited viewing angles and can make the display look discolored when it is viewed off-center. Disadvantages of Virtual Pixel Configurations: LED sharing results in weak color contrast and uneven edges on text as the pixels bleed into one another when they overlap. Virtual resolutions with two red LEDs cause white graphics and text to look pink because red LEDs dim at a slower rate than blue and green. Pixel layouts that use 4 LEDs do not allow for consistent black space. This results in fuzzy images that may appear washed out. Color blending suffers on virtual configurations using the missing LED layout, compromising image quality. An LED sign is a smart advertising investment for any organization – a business, a church, a school or a municipality. Other forms of advertising simply can’t come close in scope, efficiency or value. LED signs are the most effective, least expensive form of advertising for small businesses according to the Small Business Administration (SBA). An LED sign gives you the ability to target a large, critical audience of potential customers already at your front door for far less than a traditional advertising campaign would cost. Advertising is traditionally measured in CPM, or cost per thousand impressions. In a typical town, an LED sign might cost as little as 74 cents per 1,000 impressions — compared to over 22 dollars for television and 13 dollars for radio. Many organizations find they can reduce their advertising budgets for other mediums because their LED sign is so effective.